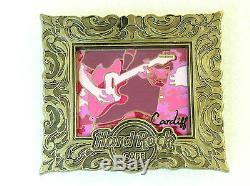 The item "CARDIFF, Hard Rock Cafe Pin, ART FRAME Series, Closed Cafe" is in sale since Friday, July 29, 2016. This item is in the category "Entertainment Memorabilia\Music Memorabilia\Rock & Pop\Artists H\Hard Rock Café\Pins". The seller is "summer2431" and is located in California. This item can be shipped worldwide.